ATVConnection.com ATV Enthusiast Community - Is using my winch to load onto a pick-up a bad idea? Is using my winch to load onto a pick-up a bad idea? Hey folks, I'm a total ATV newbie at 51 years old. 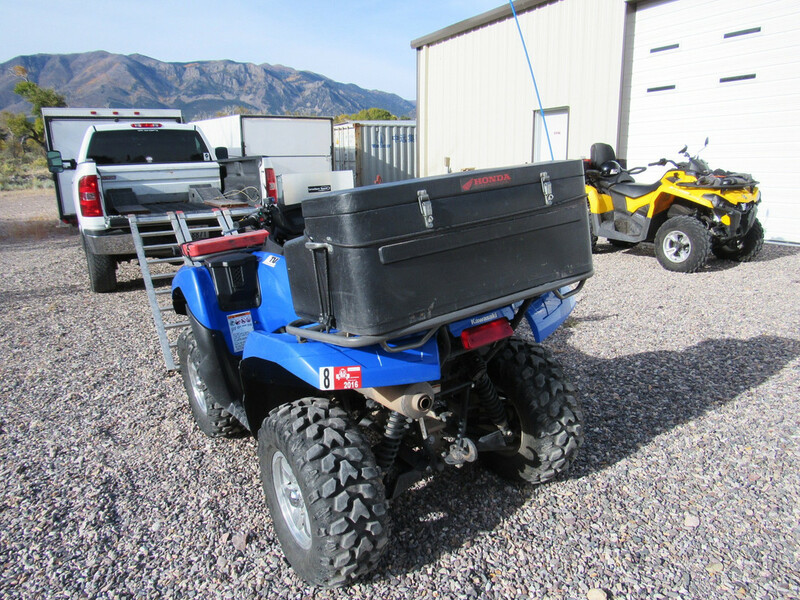 The walk across my 350 acre hunting lease was getting to me, so I finally broke down and bought a quad. Here's the thing -- I was watching videos of how not to load a quad onto a pickup and my wife saw and is now convinced I'm going to kill myself driving up into my truck. I was wondering if putting a chain across my bed hooks up at the front and then attaching my winch to the center and pulling the quad up in at a very controlled pace would be a good way to load and unload -- at least until I get a little more comfortable with my quad. Is there any downside to doing that? Let me know if I'm asking for trouble, please. Thanks so much! P.S. NEVER use your winch to tie down your ATV. It can break the gears in your winch. Put some short chains in the corners. Something to strap to and chain ramps too. I have to wonder what the rating is for this tie points in the bed. Though you are in neutral with wheels supported,. Driving a sled up the ramps can be tricky due to just the right speed. A 4 wheeler is just a matter of getting comfortable IMO. Does your wife have any ATV experience or just telling you what to do? Backing into ditch or a hill can work if you find the right spot. That is how I have loaded side by side in truck. I say get good ramps, chain them tight to truck and drive up slow. Kind of hard to see but my ramp has chains that attach to the truck so it can't slip off the tailgate. Been doing this for nearly 20 years. If you're comfortable using your winch then that what you need to keep using. Thanks for all the helpful feedback! Yes, Zerk, my wife is totally new to all of this -- but so am I. I think once I build some confidence driving up the ramps will not be much of an issue. In fact, I just bought a tri-fold ramp to take a lot of the potential for misjudgement out of the equation. I drove it up and down single ramps a couple of times with no issue -- just a little nerve wracking. For now, the quad is half torn apart in my garage while I address some carburetor issues. It looks like having it chained/strapped to the truck so it doesn't slide off the tailgate is the most important step. I think trifold will boost confidence. It can be nerve racking lining up to one ramp per tire. I started loading sleds with ramps, which is not fun cause you need just the right speed. 4 wheelers can crawl up. My ramp had cables instead of chains and I had them more or less permanently set at the length I wanted. I would leave several inches of the ramp sticking up on the tailgate, hook the cables in the holes where the tailgate latches, and slide the ramp back until it dropped down and only the fingers on the end were on the tailgate. It couldn't move more than a tiny fraction of an inch front to back or side to side. I know Charlie's Accident has been posted on here several times but here it is again. Learn from his mistakes so you don't have to learn from your own. Absolutely okay to use your winch to load your ATV. Just dont use it to hold it there. Winches arent made to hold a load, especially one that is jostling by acceleration and braking forces. IRT securing your ramps, think about drilling a hole thru each ramp right where it lays flat on your tailgate. Also drill a matching hole into your tailgate that is slightly larger than the bolt or pin you will use on the ramp -->.. Now take a bolt or a press pin and insert it thru the hole in the ramp into your tailgate. Secure it somehow so it's permanent enough so it wont just pop out. Now everytime you go to put on your ramps, the pins or bolts will line up with the holes in your tailgate and they won't slide off when your accelerating up the ramp. Not many people want to drill holes into your truck tailgate but just think of how easy it will be to pop on & off your ramps. Personally I would not use 5he tailgate to secure load. I would use the hooks in the corner. I never thoughthought of using them as a winch anchor, but I guess you tie them down to it.